Concrete is as hard as rock, and grinding its surface requires abrasive blades and tough power tools. Concrete wall grinding tools include lightweight, portable power tools and heavy-duty machines. Whether you're refinishing an existing wall or completing new construction, become familiar with the applications and capabilities of concrete grinding tools, and choose the right one for your project. This portable handheld power tool is the common concrete wall grinding tool. Typically powered by an electric motor, the angle grinder is available both corded and cordless. The angle grinder looks like a small version of the carpenter's circular saw. Unique to this tool is the angle at which its blades rest; rather than parallel with the tool's grip like the circular saw, the angle grinder's blade rests perpendicular to its grip. Angle grinder blades range in diameter from approximately 3 inches to over 10 inches. Blades suitable for grinding and resurfacing concrete walls are made of diamond or coated with an abrasive mineral grit, such as carbide. 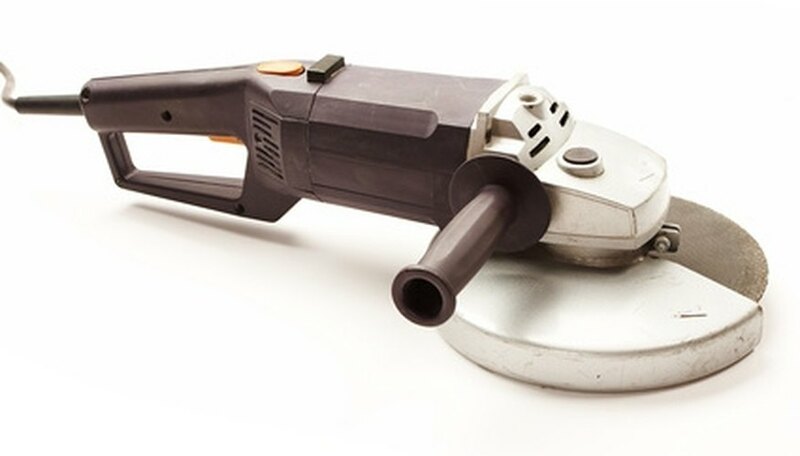 Nearly identical in form and function to the angle grinder, the air grinder employs the pneumatic force of compressed air to spin its abrasive blade. A hose running between an air compressor and the grinder supplies compressed air to the tool. Like the electric angle grinder, the air grinder's blades range from roughly 3 inches to 10 inches and are made of diamond or mineral grit. Pneumatic force often supplies higher torque than electricity, offering a more powerful resurfacing option. The dustless grinder combines the abrasive capabilities of the angle grinder and air grinder with the suction of a vacuum. A fabric cover envelops the area surrounding the blade of the typical dustless grinder. The motor creates suction within the enveloped area and removes dust and debris as the blade spins, abrades and resurfaces a concrete wall. The dustless grinder saves a concrete worker the time and effort required to perform extensive set-up and cleaning.